James Harden is one of the NBA’s most eccentric characters, but he’s also a bona fide killer on the court. Apparently that includes any court against any competition. Especially when that competition is a little kid attending his basketball camp. 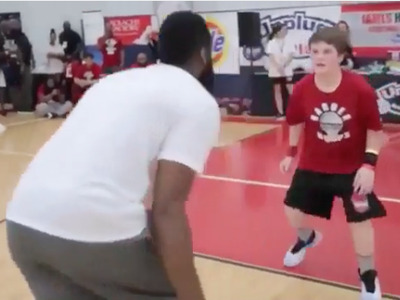 As if often seen at NBA players’ camps, Harden challenged a young camper to a little one-on-one. That’s when Harden, one of the best ball-handlers in the NBA, pulled out a trick move that stunned the kid before he scored on an easy dunk. The best part of this video is that Harden celebrates after like he just won the NBA Finals. Obviously, he’s just hyping it up to get the kids excited, but in all fairness, that was a pretty inventive move.